On This page you will find the DO's and DON"TS for training your new dog. Following these instructions of this to do and not to do will help you in growing up a smart, independent puppy without anxieties. Help fix separation issues and get you the smartest most confident pup you ever met. I wrote this page to help those who adopt a well adjusted puppy who becomes a terror in matter of days. ​ALWAYS REMEMBER, just cause they are so cute doing something, if it isn't a behavior you want months or years later, don't allow it now. CRATE TRAINING: Yes we recommend crate training for puppies and new dogs. Many might ask why? as they don't plan to crate there trained dog. Well we believe it is a good foundation for getting a puppy trained and learning to be independent. So how do we crate train and how long? Where to put the crate? How big is the crate? and more! SIZE of crate: should be not much bigger then the puppy him/herself. So for our puppies the smaller crates work well. Or you can get the wire one with divider. If your puppy has room to pee in one corner and sleep in anther, he/she just might potty in the crate. But if he/she has to sit in his/her potty, then puppy will do his/her best to attempt to hold it and get you to let them out. So make the crate space big enough to sleep comfortable, turn around and move without much extra space. Once your puppy is holding potty well and doing good, you can use a big of crate you like. Then if making accidents in it, go small again. WHERE to put the crate: This can vary by individual puppy. Some puppies can become anxious and barky watching you move around the room or waken each time you move at night. These puppies might need to be in another room further out of sight and sound. Other pups are not so bothered by your moving about and remain calm. So that you have to feel out. Might be out near you during the day and in another room at night, or vise versa. You may have to play around with it a bit to figure out what works for you and your puppy. HOW LONG can puppy be in the crate? This varies for each and every puppy. Age of puppy, and feeding schedule. Puppies can be expected to hold potty there age in months plus 1. So an 8 week old puppy should not be expected to hold it for more then 3 hours during the day. Puppy will need to go OUTSIDE every time puppy gets out of crate. Releasing puppy to the indoors he/she will potty inside. A puppy can go more hours at night if no food and water for few hours before bed and he/she is kept awake till bedtime. By 10 weeks it is not unreasonable for a puppy to make it a 7 hour night. WHEN should you crate a puppy? AT NIGHT, you are not awake to supervise puppy, he/she needs to sleep. So he/she should be in a crate. They need to learn to sleep independent of you, not in your bed or touching you. But independent by him/herself in the crate. LEAVING? then your puppy needs to be secure and crated for safety and to keep from having accidents while your out. (remember to come home and let him/her out in proper timing). Your puppy will need to know how to be good in a crate for flying, at vets, car rides, and other times in life might have to be in a crate. They need to be comfortable with it. Anytime your not able to be watching and supervising your puppy. He/she should be secured in crate. Crate not needed for life of dog, but training purposes and growing up a good mature, happy, well adjusted puppy, you want your puppy to accept crate time without issue. WHAT to put in crate with puppy? Your puppy should always have a bed/towel/ soft absorbent item to lay and sleep on. If at night, that is all they need. They are supposed to be sleeping, not playing or drinking. During the day, puppy should have water, toys, and chews. Sometimes a water bottle works better then a dish they can spill. HOW to get your puppy into the crate. Place a treat into the crate and give puppy a command to enter the crate. You can use "House" "Kennel" "Den" or whatever word you want it to be. You can practice it without locking door on them each time. Then close it sometimes, not other times, and close and walk away, open when they lay quietly. And just practice it as you would with a sit command. Do this exercise with closed crate and leaving room, only when puppy is calm and quiet do you return to let out. This exercise will help prevent separation anxiety and teach independence from you. Always make sure he/she has pottied prior to a long crate time. PUPPY CRIES! : How do you know if puppy is ok when he/she is crying in the crate? Puppies cry for many reasons. You will quickly learn to tell the difference between there cries. A loud yap can mean they want out and want attention. DO NOT GIVE IN. A whimper or circling action can mean the need to potty (If you feel that is the case, then take them out to potty). But the number one RULE of crate training is NEVER LET PUPPY OUT FOR CRYING. If your puppy is crying, screaming, barking, yapping, pacing, panting, or acting anxious. DO NOT OPEN THE CRATE. If you do, you will train the puppy that the behavior gets your attention or gets them out. After a quick look to ensure they are safe and ok. You need to be strong and ignore them. Leave the room, leave the house, and/or move them to another spot. But going to your puppy and giving reassurance and saying your ok is WRONG. DON"T DO IT. They think your coming to rescue them, the crying got your attention and you talked to them even if they didn't get out, it got something from you. So they will keep it up. You must ignore it and pretend you don't hear them. (Some puppies respond well to a harsh "Shush" command with a loud tap on the crate or spritz of a water bottle, to quiet them faster then the ignoring) Only when the puppy does get quiet and settled(not panting, pacing or anxious either), at that time, go to them and let them out. If you give into your puppy for crying then he/she might become clingy, noisy, and develop separation anxiety. So again, do NOT open the crate or give attention for a puppy that is not quiet and calm. IF your toddler throws a tantrum for being stuck in a car seat, you don't let them out.. If your puppy throws a tantrum for being crated, you don't let them out either. If you let the kid out of carseat or the puppy gets released from crate for throwing a tantrum, well then expect more tantrums tomorrow! ​TIMEOUT: Yes puppies get timeouts just like toddlers. But puppies timeouts need to be in a safe, secure spot away from all that is going on in home. It can be in a crate, in a laundry room behind gate. In bathtub. Wherever you choose. When puppy earns a timeout, you take puppy by collar or carry puppy to timeout. Place them in it quietly without anger or saying much of anything to them. Leave them there only until they are calm and quiet. Is your puppy being aggressive, biting, nipping, attacking the brush during grooming. NO matter when you puppy attempts to bite. You need to be in CONTROL. If he/she is doing these behaviors. They are struggling to gain control of you and the situation they are in. If you give in and allow the behavior to work. THEY WIN, YOU LOSE. Next time will be worse. And eventually you might have a dog you can't touch. Or maybe just can't do the one thing they won on. If a puppy knows he/she can win in one situation, they will test you for another and another, while some work, some don't and they learn where and what they can get away with. SO, if you decide to start a training session, you must have the time and patience to follow it thru till you succeed and puppy gives in. BRUSHING: lets use this as prime example. When a dog comes to me or groomer, you hear they were such an angel from the groomer. Yet when you touch the brush there teeth come out. Well, this shows that the groomer is confident and in control and puppy gives then full control. But they see you as unsure and weak and take advantage of that. Then after you get bit, you put brush away. WRONG MOVE. You need to end a brushing session (even if you only do just one little spot of brushing) on a good note. Never end it with teeth showing. You will want to start with breaking it up into small sessions. Start with a tired puppy, not a energized awake puppy. Plan to brush one leg a day, then the head, tail, and face each separately each day. So your not going thru a long struggle. Then puppy can have a short easy lesson each day that must end on a good note. If biting is bad, get a second person to assist in this training. So that second person can help secure and hold. Usually works best to place puppy up high, on top of dryer, table, counter, etc. So they are up and closer to your control. Do not pet and say its ok in a reassuring voice as they will either make them uneasy, unsure, worried, or feel rewarded for a behavior you don't want more of. Get a firm and strong grip on the part of your puppy you wish to brush. Have second person do same with head if needed. Then just say in firm strong controlled voice, your fine. If they pull turn, fight, or attempt to bite, do NOT let go. If you do they win! Remember, you must win to get control. Groomer can do it cause they don't give puppy chance to take control. You can do it to. Just brush a small area, or rub that area until the puppy is calm. Then release them and call it a good training session. But you must go till they calm down and let you do the desired area. Don't push them further right away as you want to end on a good note or next time will be worse. If you are working on a leg that session, do not release the leg when attempting to bite or pulling it away from you. If you do, they win. Even if you get no brushing in, just hold the leg till they give you control of it and relax there leg in your hand. If you got your puppy from us, he/she was tolerant and cooperative prior to leaving here. So if they display this behavior, they are testing you. Remember who must win to have control. POSSESSIVE: Do they guard toys and chews and snap if you take them? If they do, they are CONTROLing it. Remember, for a happy puppy, they must understand you have ultimate control of everything. This is why teaching the drop it command is good from time puppy comes home. When giving treats, hold it in your closed hand. When puppy sits calmly, not touching your hand but paying attention. Then open your hand and let them get the treat. Don't give it to them while they are trying to chew your fingers open. It gets released when they show self control by letting you be in control. Place your fingers in the dish while they eat, add pieces of food to dish as they eat. This teaches them you control there food, not them. As if they control food and treats, they fight for control in other areas too. Only serve the food to a puppy that is sitting calm and quiet, not one jumping or barking. Cause they think jumping and barking got you to give it to them when in reality you would have no matter what, but they need to think you have control of serving it and not think they had control of it. If your puppy is eating your shoe, drop another item for them to chew. then remove the shoe. But not treats. If you use treats on the trade up, they learn to grab that item every time they can for a free treat. Cause if you do, you might have no mulch left outside and no treats left inside. If puppy is chewing your shoe, your fault for leaving it where they can get to it. And provide more tastier things to chew on. NOW, how to stop the snapping if you or another pet tried to take something. (Doing the other things will likely make this self correct). But if not, and your puppy is about to swallow something you fear not going to pass thru. you have to grab it at all cost. Most the time if you firmly grab hold of the puppy(not the object) and get a good grip on him/her, they will drop it. Go for the rump or waistline first, then work way up towards neck and head. IF a certain toy or chew makes them possessive with you or another dog. Just remove those items from play however long you have to until its no longer an issue. 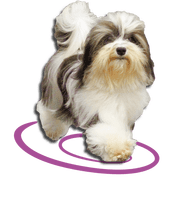 If these steps are not working, then your puppy has control in too many areas of his/her life and you need to gain full control of everything surrounding what the puppy can and can't do. If puppy is snapping at spouse or another person in home for sitting on couch, touching you, getting in bed. Puppy goes to timeout, not the spouse. BARKING: First you must try to understand why they are barking. Yelling at a barking dog can confuse them and they might think your barking along with them. If barking out a window, go between them and window, if all is okay outside, tell them thank you, and walk back away. If they continue after two more times, off to timeout again. This shows them you acknowledge the thing they barking at, and are okay with it so they should be too. If barking while in crate, they are being demanding and you can not give in. If barking at someone coming in, try thank you, if no success, then off to timeout in area they can't see anyone. Release from timeout when quiet and calm and try again when guest are seated. Repeat as needed. Is your puppy pulling, biting, or have separation anxiety? If so, then you do not have full control of your puppy in all areas of his/her life. Below are things to do to gain control and for your dog to learn to be independent and confident without you there presence. If your puppy is having these issues, you need to read all of the above info on crate training, and aggression too. Once you have FULL CONTROL of your puppy, most all the bad behaviors self correct. HOLDING: You want to hold your puppy but he/she is squirmy. DO NOT put puppy down for being squirmy. As you gave them control. Instead, just get a good secure grip and tighten the grip as he/she squirms, soon as pup calms you can lighten grip and or release the puppy down at that time. This makes them feel secure in your grip and shows them your in charge just thru gentle tightning of holding. When they surrender to a calm limp rag doll puppy, then you put them down when your ready. Don't let go when they are squirming or nipping to get away. You can not give them that control. FOOD: Make sure you control all treats, toys, food, chews. They must be quiet and calm to get treats or dinner. NO jumping, pacing, panting, barking, or scratching at you. remove toys or chews that cause possession. CLINGY: if your puppy is clingy and stuck to you. He/she is not very independent and not able to cope very well away from you. YOU need to gently push puppy off you. NO SLEEPING with you. NO sleeping on your foot or any part of dog touching you. They have to learn to be able to be independent of you. If they can sleep not touching you. They can handle you leaving the house easier. DO NOT pet a dog that jumps into lap and pushes him/herself against you. Just gently push away. If after many many attempts, then off to timeout. Try again when calm. Pet your dog when you call him/her to you and reward them for coming. But don't reward them for demanding pets by giving it to them. While you don't care that you do, they see it as controlling you. Once they are laying calm not touching you, call them in for some cuddles and pets. But don't give it on there terms for pushing you into it. IF they start getting pushy after you iniatied it, then start over with gently pushing them off. They will learn you control when you give pets and cuddles. What is your dog thinking. How do they speak to each other in wild. Can you talk like a dog so they understand? While there language is simple, ours is complex. Yet they can understand commands, behaviors, and control. But can you understand them? If your 10 yr old kid ask for the keys to drive would you let them, of course not, thats the leader in you not allowing it. But if your dog bites to get something from you, do you give in? If your toddler lays on the floor at the store cause they want you to buy them something not good for them, you shouldn't do that and know you shouldn't. So if your puppy screams and throws a temper tantrum cause he/she is in a crate, do you let them out for it? Giving the toddler the item for that behavior teaches them to do it next time too. SAME for dog. Giving in and opening crate for the tantrum, you will get more tantrums! The way you speak to you dog. Do you sound firm, in control, and to the point? Are you politely asking your dog if he wants to go outside, or do you demand lets go outside now. Its all in the tone of voice weather or not they will follow your lead. Or do you sound like a baby, worried, insecure, upset, or angry. These will mislead your dog as to what it is you actually want. They understand your tone of voice more then the words your saying when you talk to them and may hear something completely different then you thought you said to them. So if your trying to be reassuring to them acting nervous, they hear you being worried or rewarding to that behavior and only get worse. You need to be in control and say its all fine firmly, as they will react based on your reactions. If you are worried when they growl at a stranger that they might bite that stranger, most people hold dog tight and say its ok. Well dog hears, oh, she's so happy I protecting her from that person. Or if you get nervous cause your worried about there reaction, they get more nervous and more protective. If you push dog away, assert confidence, and encourage them to be independent and confident(never hold them during growling, put them down or on table if at vet or groomer) Step away and show confidence and show them you don't need protecting. Be the leader. The PACK. Dogs live in a pack, there is the alpha or leader of the pack, and each dog has his/her place in pack, down to the one on the bottom. HUMANS are in the dogs pack. You are a pack member with all your pets. SO, who is the pack leader. You or puppy? Or do you trade off. If your firm about them riding in crate in car and always make them, they let you be the leader of that during that setting. But if barking loudly gets them out of the crate at home, then they have control of it there. Leadership can trade off per situation and amount of pets and people present. Each human is in the pack. So if dog listens to one person and not another, then one person is above them in the pack while the other is below. ALL humans should always be above, so all training has to be done with all humans following same steps, this includes kids old enough to do it. Each time a new person or family or home or place a puppy goes to, they meet new pack members. They have to test the waters with there new pack to see where they fit in. IF you purchased your puppy thru me, I'm a phone call away to help you with these issues. As I've seen friendly dogs become aggressive in days and separation anxiety set in in couple days. As the puppy lost his/her leader and is now insecure and in control. But most all these behaviors self correct once full control and confidence is gained by all the humans in there life. So picture yourself as momma and papa wolves and you have to guide your young for them to survive there new world.